Our approach to downsizing ensures you make informed and well thought out decisions about what to keep, what to let go of, and to whom. After living in a home where you often can't put your hands on what you are looking for... it's nice to know that after downsizing is complete you will know both everything that is in your home... and where it is. 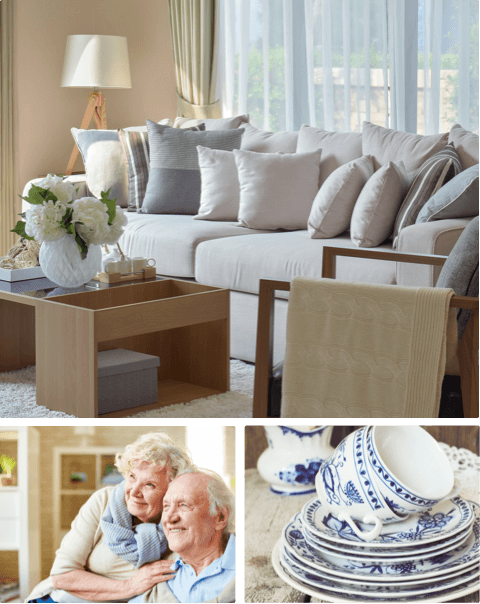 We approach downsizing and organizing simultaneously to make sure you know how and where the things you keep will 'live'. Asking discerning questions helps you select just the right items for your new home; items that reflect both your past as well as your current interests and lifestyle. The process is gently paced; not too fast and not too slow which allows everyone to stay focused, and stay within designated time frame. Determining what will be the most profitable way to dispose of the items you no longer wish to keep is discussed and evaluated for your decision making. Sorting and organizing your items is the first step of downsizing. Getting things out where you can see it all helps you discern how much is enough, and what you still truly enjoy and love.